[Go Back] [New Search] Details for Eisen Tomioka (1864-1905) "Beauty and the Moon"
Condition very good … paper toning, three horizontal folds usual for kuchi-e, slightly soiled, lightly creased, light red transfer ink stains on the bottom area, not backed. 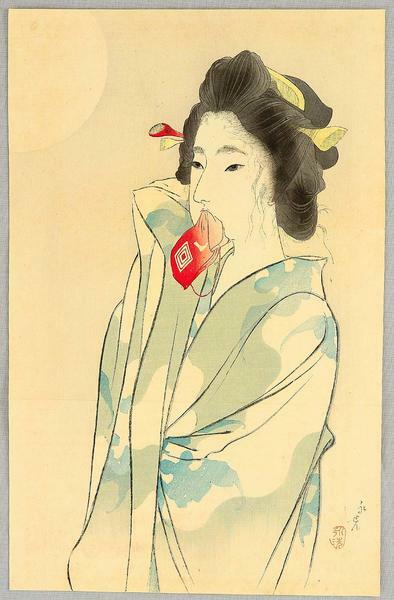 Description "Yokugo no Bijin" (Beauty after the Bath). The full moon shines on the beauty in summer kimono. A rare large format kuchi-e from Bungei Kurabu magazine, Vol.11, no.10..